The World of 7 Billion contest is a project of the Population Education program, provider of K-12 classroom resources and professional development opportunities. SooMin, who lived in Malaysia before moving to South Korea and Faith, who lived in the U.S., narrowed their focused on slums because they find that they are so common and easy to spot. In order to reach a range of age groups with their message they chose to create an animated film. The girls are no strangers to filmmaking since they’ve made a few for other school projects. However they did find it challenging to concisely convey all the information they had learned into the one minute limit. Both SooMin and Faith plan to save their prize money for future use. 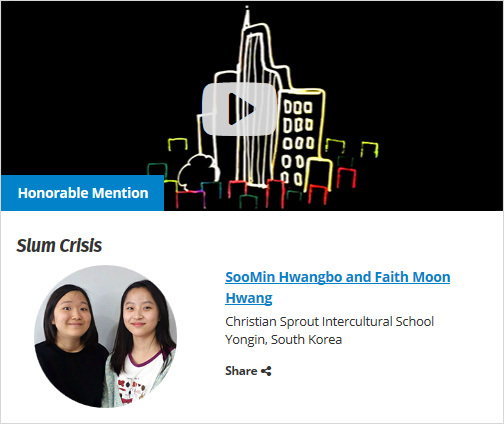 In her spare time, SooMin enjoys cooking, baking, singing, and photography while Faith enjoys video editing, drawing, and writing stories. 20	 2015 CSIS 기독학교 Summer Camp ! 17	 2014 CSIS Summer Camp !